I know I promised that I wouldn't go to the craft store, but I was out of fusible interfacing and what can you make without fusible interfacing and I also had this idea that needed ric rac and while I was there I saw a boootiful piece of linen for $2 so you can't fault me for any of that... and I have my period. 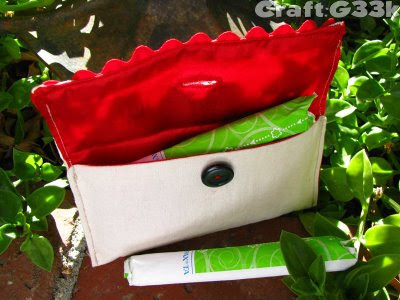 Yes, today I made a tampon cozy. And it has a face. A *grimace* face. How-to follows, but if you don't want to know how-to, scroll down to the fun part at the end. 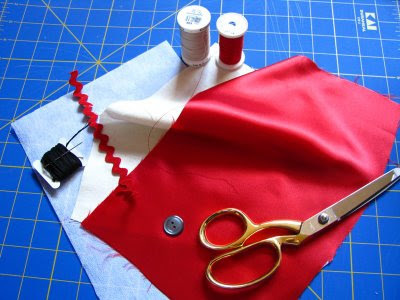 Clip 3/8" seam allowance off interfacing and fuse to outer fabric. Embroider eyes 2" from the sides and 1.75" from the top. 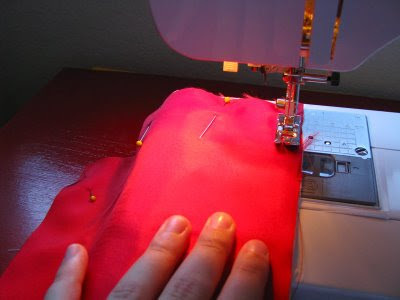 Pin outer fabric to lining fabric, wrong sides together, and sew together leaving 3/8" seam allowance. 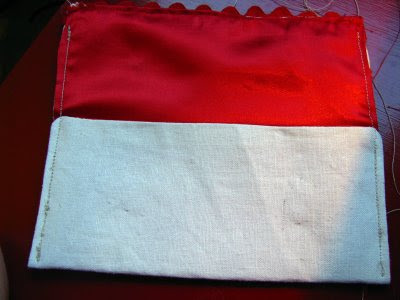 Pin ric rac to the top of the front, and fold edges into the openings. Sew in place. 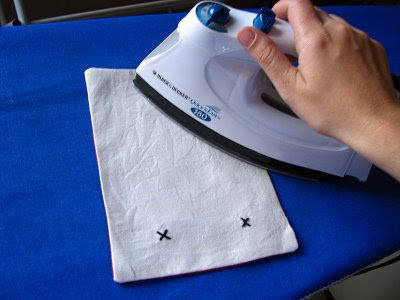 Fold over the bottom so that the top flap is 2.5" long. 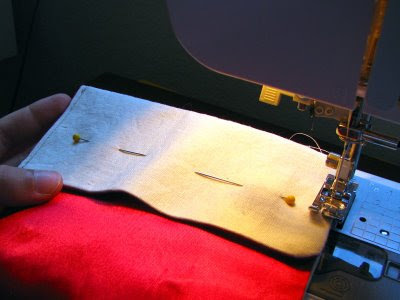 Pin in place, and sew down the edges. 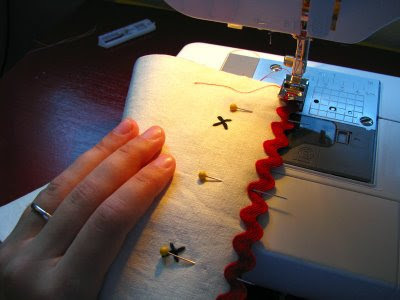 I recommend using a topstitch or denim needle for this, as the fabric is quite thick here. 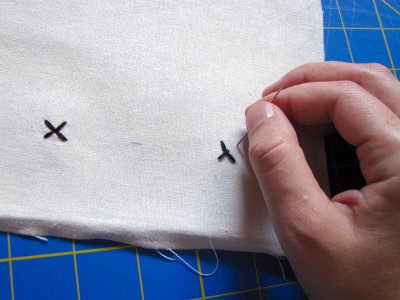 Pull out your buttonhole foot and make a buttonhole between the eyes, about 1" from the edge. 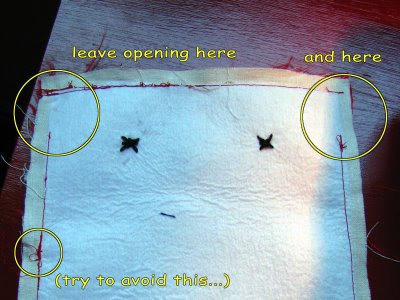 Sew button to the inside about 0.5" from the edge. Stuff with four tampons and go! Since I ran through this design twice to get the how-to right, I have an extra tampon cozy. So, giveaway! If you would like this tampon cozy, introduce yourself in the comments, and leave some way to contact you, and I'll pick a winner next week. Good times!! I think that this is hilarious. I usually feel this way, when it's that time and this is totally appropriate. It would make a good gift for friends as well. I found your post on craftster, my name is Jessica and you could pm me on there if I win! I too saw your post on Craftster and I think this is great! I think we all feel this way and it is nice to put a "face" to it. LOL! You can PM me on Craftster too. I didn't even realize, but I didn't put my craftster name on here- it's Jessbee21. Thanks again, and I hope I win! 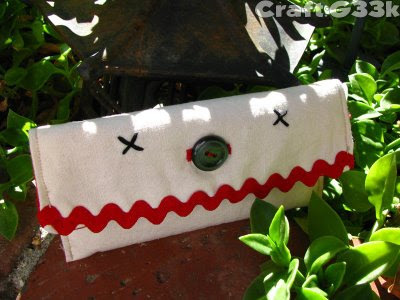 hahaha, that is THE cutest tampon cozy I have ever seen! I would love to be in the running to win it!